According to the report, exports jumped from $244.3 million in 2014 to $247.5 million in 2015. Almost 51 percent, or $125.6 million, of goods exported came from transportation equipment manufacturing—followed by plastic and rubber products at $36 million, machinery at $33.3 million, and fabricated metal products at $8.3 million. 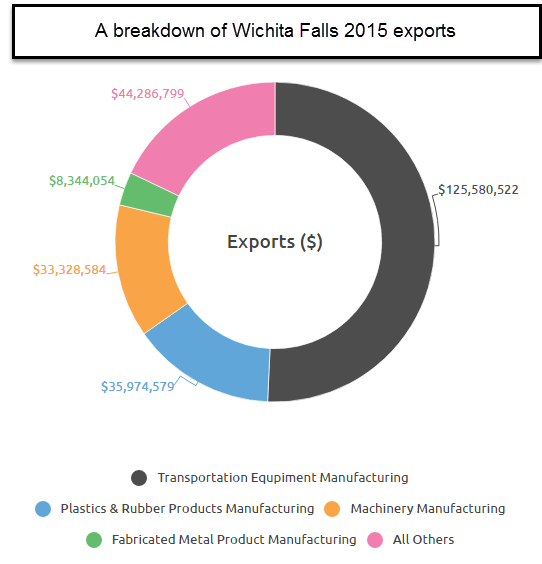 Exports in the Wichita Falls area hit $184.9 million in 2005 and climbed to $212.2 million by the end of 2007. A downward trend ended in 2010 followed by a 36 percent increase in 2011 to $200.5 million and a 12 percent jump in 2012. Exports continued to rise incrementally since, but have a slowed some.